Back to school is right around the corner. While we homeschool many of our friends have children in public or christian school. Our older boys even went to private school for some time. So the anxiety of first days and summer ending are not lost on our family. 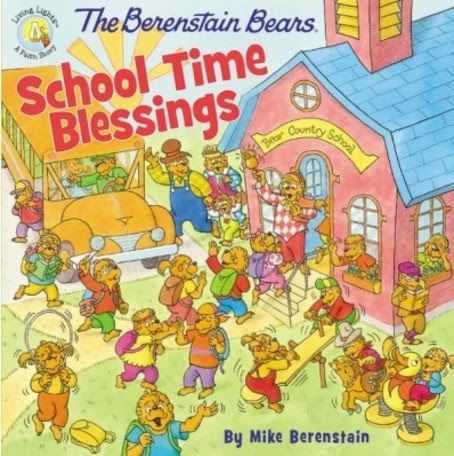 The Berenstain Bears: School Time Blessings is the sweetest book. Honey is going to preschool for the first time and the cubs are nervous about what subjects they will learn. Mama and Papa Bear remind them that they will be there to help and that they can also turn to God for strength. I love how these books bring faith to children through practical examples. This is a fabulous book because of that. Seeing the family quote scripture and pray together - just like our family does - brings home that these are strong principles for guiding our lives.